Preprints (earlier versions) of this paper are available at http://preprints.jmir.org/preprint/9811, first published Jan 09, 2018. Background: Gout is a form of chronic arthritis caused by elevated serum uric acid (SUA) and culminates in painful gout attacks. Although effective uric acid-lowering therapies exist, adherence is low. This is partly due to the lack of support for patients to self-manage their disease. Mobile health apps have been used in the self-management of chronic conditions. However, not all are developed with patients, limiting their effectiveness. Objective: The objective of our study was to collect feedback from gout patients to design an effective gout self-management app. Methods: Two descriptive qualitative studies were conducted. 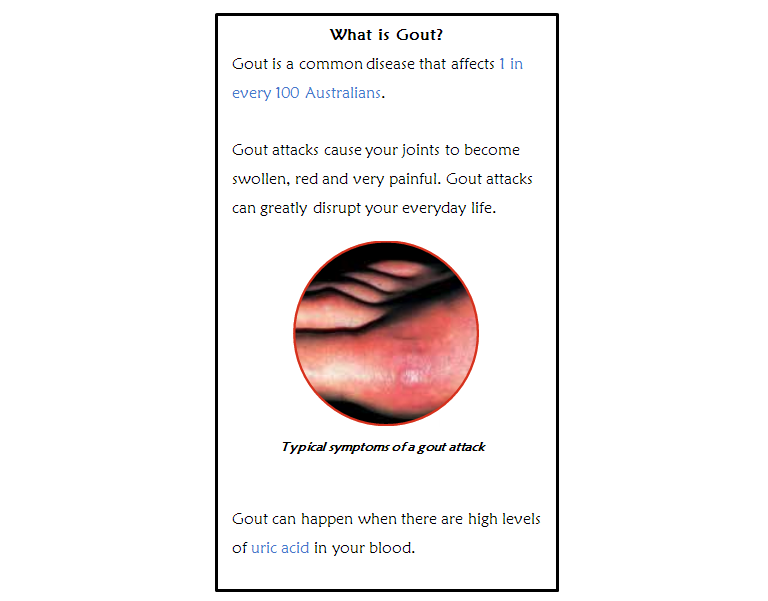 In Study 1, researchers developed a short educational video and written materials about gout management, designed to be embedded into an app; 6 interviews and 1 focus group were held with gout patients to gather feedback on these materials. Usability testing in Study 2 involved additional gout patients using a pilot version of Healthy.me Gout, a gout self-management app, for 2 weeks. Following the trial, patients participated in an interview about their experiences using the app. Results: Patients viewed the gout educational material positively, appreciating the combined use of video, text, and images. Patients were receptive to using a mobile app to self-manage their gout. Feedback about Healthy.me Gout was generally positive with patients reporting that the tracking and diary features were most useful. Patients also provided suggestions for improving the app and educational materials. Conclusions: These studies involved patients in the development of a gout self-management app. Patients provided insight to improve the app’s presentation and usability and general lessons on useful features for chronic disease apps. Gout patients enjoyed tracking their SUA concentrations and gout attack triggers. These capabilities can be translated into self-management apps for chronic diseases that require monitoring of pathological values, medication adherence, or symptoms. Future health app design should integrate patient input and be developed iteratively to address concerns identified by patients. Mobile health (mHealth) technologies present opportunities for improving patient self-management of chronic diseases [1,2]. Smartphones and tablets are increasingly used worldwide, and more than 100,000 health-related apps are available to users . Studies have shown that user-centered design is key to ensuring that mobile self-management apps are effective in heart health, diabetes, and asthma [3-6]. However, very few apps are codeveloped with end users, limiting their uptake and effectiveness. Gout is a chronic form of arthritis that causes a significant health burden worldwide . It results from elevated serum uric acid (SUA) concentrations and culminates in debilitating gout attacks [8-10]. Successful gout self-management is dependent on behavioral factors but ultimately upon medication adherence. Highly effective uric acid-lowering therapies (ULTs) are available. However, adherence to ULTs in gout patients is very low; in fact, it has the lowest adherence rate of all chronic diseases . Poor quality educational resources and limited patient knowledge have been identified as key barriers to adequate ULT adherence [12,13]. An intervention that was delivered by nurses comprised personalized education, lifestyle advice, and appropriate prescribing of ULTs resulted in 92% of patients achieving target SUA concentrations 1-year post intervention . Although effective, this intervention was very labor and resource intensive and therefore, unlikely to be sustainable in the long term. A more automatic and far-reaching method of delivering education and lifestyle and treatment advice could be via an app. Previous research has identified that no completely electronic app existed that contained all the required features to support patients in self-managing their gout effectively. One app incorporated these features; however, it required patients to manually complete print-outs to record their SUA and gout attacks . Further, there was no evidence that these apps were developed using patient input. In response to the limitations of the existing gout management apps and the potential for a high-quality app to improve patient self-management of chronic gout, a pilot version of the Healthy.me Gout app was developed. Healthy.me Gout is an adaptation of Healthy.me, a general health app and website, with personal health records, educational information, and Web-based patient support. 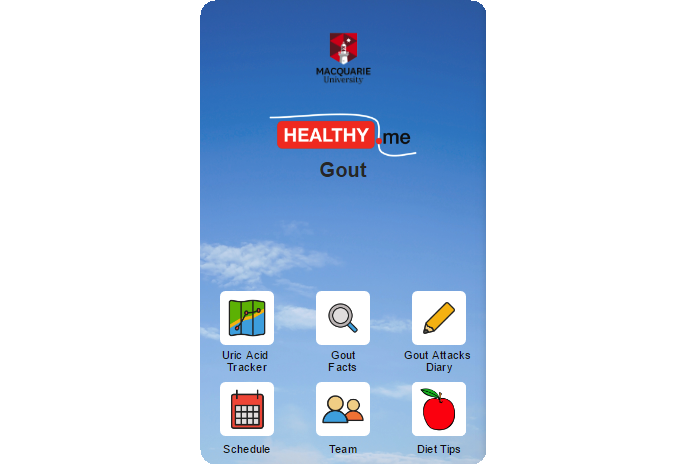 This study aimed to build an effective gout self-management app by seeking patient input on prototypes of educational material designed to be embedded into the app and to obtain patient feedback of a pilot version of Healthy.me Gout. Ethics approvals for these studies were obtained from the University of New South Wales Human Research Ethics Advisory Panel (references #HC16263 and #HC15199). This paper describes 2 studies that were conducted in parallel. Study 1 explored the opinions of gout patients on the content and format of prototypes of educational material on gout management. In Study 2, gout patients participated in app testing where they were given 2 weeks’ access to an initial iteration of Healthy.me Gout, an app designed for patients to self-manage their gout. Following this period, patients participated in an interview about their experiences in using the app. To recruit patients with gout, 2 strategies were adopted. The first approach involved contacting general practitioners throughout Sydney, Australia, via email, phone, fax, or in person to distribute invitation letters to their patients with gout. General practitioners were asked to provide the researchers with the contact details of patients who expressed an interest in participating in the study. These patients were then contacted by researchers. This recruitment strategy was supplemented by posting study flyers in pharmacies and medical practices across Sydney and public spaces at St Vincent’s Hospital, Sydney. Rolling recruitment for Study 1 lasted approximately 12 weeks until theme saturation was reached. Recruitment for Study 2 was conducted concurrently. All participants were reimbursed with an Aus $50 gift card. Inclusion criteria for both studies were adults with a diagnosis of gout, and exclusion criteria included cognitive impairment or limited understanding of English such that participation in an interview or focus group would be difficult. Participants in Study 2 also had to have access to a smart device. Written educational materials were developed using a combination of resources obtained from consumer group organizations, Australian Rheumatology Association, Arthritis Australia, and the European League Against Rheumatology guidelines for gout management . The materials addressed important aspects of gout and its management. The topics included symptoms of gout attacks, diagnosis of gout, hyperuricemia as a cause of gout, risk factors for gout, consequences of chronic hyperuricemia, acute gout treatments, use of ULTs and the importance of ULT adherence, and prophylaxis during ULT initiation. The research team, which included a senior rheumatologist, reviewed the information to validate the content. The information, written in plain English, was embedded into paper prototypes to simulate how the information would appear on a smart device screen in terms of the size and location of text, as seen in Figure 1. Blue-colored text was used to indicate hyperlinked keywords, simulating how users would be able to use these to click to different pages in the app. Images were included in the written materials. A 2-minute animated video was developed to introduce gout management and highlight the importance of adherence to ULTs. The video was designed to be conversational in tone and employed a persona, “Gout Man,” who depicted a stereotypical gout patient, as seen in Figure 2. The video included a graph that represented monitoring SUA over time, as seen in Figure 3. The graph highlighted the relationship between SUA and gout attacks, demonstrating that as SUA concentrations decrease, the likelihood of pain from gout attacks decreases. The target for SUA was displayed on this graph as a perforated line. Patients were provided with the option of attending either an interview or focus group based on their preference and convenience. Using a semistructured interview guide (Multimedia Appendix 1), 6 one-on-one interviews (average duration, 45 minutes; range, 15-56 minutes) and 1 focus group (with 5 patients, 102 minutes in duration) were held to obtain feedback on the educational materials. Broadly, patients were asked questions covering their opinions of the presentation and content of the written and video educational resources. All interviews were carried out by a fourth-year medical student, and the focus group was cofacilitated by a PhD research student. The interviews and focus group were audiotaped and transcribed verbatim for analysis. Thematic analyses of the transcripts were carried out concurrently but independently by 2 researchers (AN and MW) to determine when thematic saturation occurred . Transcripts from approximately half of the participants were initially reviewed and coded for themes after which researchers convened and developed a coding framework using an inductive approach, allowing for the most predominant themes to be identified. Emerging themes were categorized into patient perspectives of the educational materials and suggestions for improvements. All transcripts were then reanalyzed using this framework and coded under the predetermined themes; 2 coders resolved any discrepancies by consensus. Figure 1. Example of the paper prototype of written educational materials shown to gout patients. Figure 2. 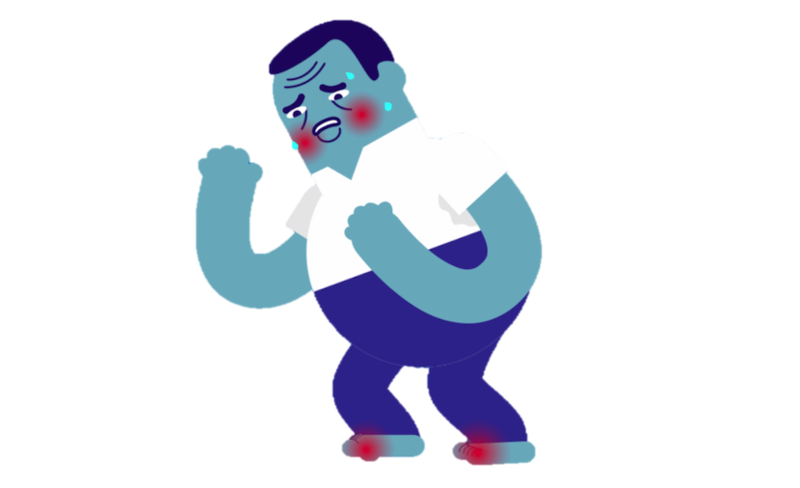 "Gout Man" as depicted in the animation video. Figure 3. 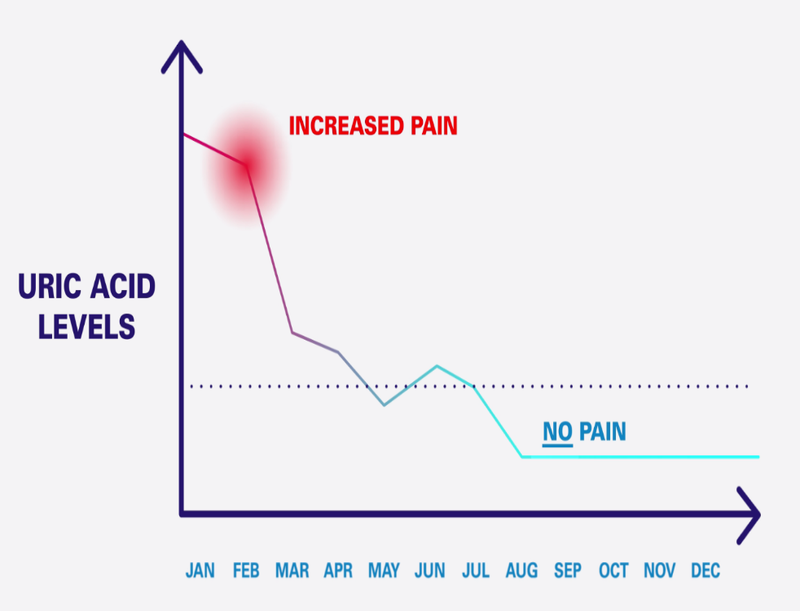 Graph of serum uric acid tracker shown in the educational animation video. The written materials and animated video were incorporated into an app called Healthy.me Gout. Healthy.me Gout is a modified version of Healthy.me, a general health app that has been shown to improve influenza vaccination rates and address the needs of breast cancer survivors [18-20]. Healthy.me Gout was developed after interviews with patients regarding their current gout management , a review of commercially available apps for patient self-management of gout , and subsequent feedback from gout patients on these apps and the generic version of Healthy.me . Healthy.me Gout contained 6 features, as depicted in Figure 4 and summarized in Table 1. Patients were asked to use Healthy.me Gout for 2 weeks and explore each feature of the app to assess for app usability. Patients were advised that they would be emailed 4 mock SUA values approximately 4 days apart for them to enter into the “Uric Acid Tracker” feature of the app, and these SUA values were 0.70, 0.50, 0.34, and 0.25 mmol/l, respectively. Because it was unlikely that patients would have their SUA measured during the 2-week trial period, this allowed patients to experience inputting data and visualizing SUA values being plotted on the “Uric Acid Tracker” graph. Throughout the 2-week period, activity log data were collected in the background with times of patient log-in and use of the features recorded. Figure 4. Screenshot of Healthy.me Gout home screen. Source: Image created by the authors, together with “The Explainers”. Table 1. Features of Healthy.me Gout. Following the 2-week pilot, patients participated in a short interview conducted by a postdoctoral researcher (average duration, 26 minutes; range, 15-33 minutes). The interview guide is presented in Multimedia Appendix 2. Patients were asked about their experiences of using Healthy.me Gout, including any challenges faced and the perceived benefits of the app. The interviews were audiotaped and transcribed verbatim. The review and coding of themes were carried out by 2 postdoctoral researchers (AN and LF). The researchers discussed the themes that were identified individually and agreed upon the main themes that arose. Activity log data were tabulated to calculate patient usage of the app (ie, the number of times each feature of the app was accessed and by which patient). Overall, 11 gout patients participated in Study 1, at which point theme saturation was reached; 5 patients were recruited via their general practitioners, and 6 responded to flyers. All 11 patients were male and aged between 32 and 85 years (mean, 60 years). The time since their gout diagnosis ranged from 3 to 25 years with 8 patients reporting having experienced 2 or more attacks of gout in the past year. Although all 11 patients owned a computer with access to the internet and were frequent users, only 8 reported owning a smartphone. Patients provided their opinions on the content and presentation of the information shown in the video and written formats (Textbox 1). Patients also provided suggestions for improvement to the written materials and educational video, summarized in Textbox 2. Overall, 5 patients were provided access to Healthy.me Gout. Of these 5, 3 also participated in Study 1. The patients were all male and were between the ages of 50 and 69, except for 1 who was younger than 40 years old. The patients had had gout for an average of 7 years and reported experiencing 4 attacks, on average, in the last year. All gout patients in Study 2 owned a smartphone and computer and accessed the internet frequently. Patients were interviewed following their use of Healthy.me Gout, and the findings are summarized in Textbox 3. Textbox 1. Patient feedback on gout educational resources; example quotes are in italics. Textbox 2. Suggestions from patients to improve presented gout educational resources; example quotes are in italics. Textbox 3. Summary of patient perceptions and suggestions for improvement of Healthy.me Gout. With any medical condition...if one is relying on memory...It’s hard to remember. Whereas if the gout app retains those records then it’s a great help to look at the current condition. It’s [the written information] good because they’re apt sentences but they’re not lengthy ones, and in reading an app or data...it’s a real turn-off to read an inch or a long, long paragraph — so, short and sweet sentences are great. Patients reported that the content included in the “Gout Facts” and “Diet Tips” sections was useful and that the still images served to help the patients visualize what was described in the text. In contrast, the animated video incorporated into “Gout Facts” was described as too general and would only be viewed once. The “Team” feature of the app was noted to be useful for the contact details of nonregular healthcare providers, such as specialists. However, patients did not find this feature useful otherwise, particularly for including contact details of their general practitioners who they regularly visit. The results don’t come to me so I won’t actually know what my uric acid level is until I’m sitting opposite Dr [name withheld]...I don’t get a copy of the report. So, yeah, automatically inputted in. If you have an attack it’s probably good to see if there’s a pattern...if there’s certain times of the year or certain triggers. It would be nice to use it in the long term. If the individual entries can generate a report, that is either printable or emailable to the doctor; that makes sense to me. In other words, it’s creating a history. To be honest, I don’t really see the purpose of this one ‘cause if I am going to call my [general practitioner], I can just go to my phone book and just go to dial the [general practitioner]. I really would like to have [a list that] is relevant to me, so...proven high purine fruit and veg and drinks, yes, but then allow me to create my personal, relevant lists...so as I’m putting in an attack I can access the relevant triggers that have caused me issues in the past. Some patients also stated that the list of restricted foods was not extensive enough. Patients reported that they would continue to use the app with access to the “Uric Acid Tracker” and “Gout Attacks Diary” being stated as 2 of the main drivers for this. App usage data showed that the “Uric Acid Tracker” was the most accessed feature of the Healthy.me Gout app, as seen in Figure 5, and that, on average (final bar of each feature), patients (individually represented as the first 5 bars of each app feature) accessed the app on 5 separate days in the 2-week trial period (range, 4-7; data not shown). Figure 5. Number of times each feature of Healthy.me Gout was accessed by patients during the 2-week pilot. UA: uric acid. If you’ve just been diagnosed, it’s got some good facts, and if you’re interested in working out some patterns, it’s good. I think newly diagnosed people can learn more from the gout facts, and also tracking their uric acid index...this is pretty straightforward, answers all your questions about gout, so I think it will be good. This study demonstrated the importance of involving patients in the design and development of a self-management app for gout patients. Patients said that they were open to using an app to support the self-management of their condition. Patients reported that the most useful features of the app were the ability to monitor their SUA, record gout attacks, and access educational resources. Importantly, patients provided feedback to improve the app and the educational material embedded within it. Previous studies have shown that incorporating images into educational materials increases their effectiveness specifically by improving patient attention, comprehension, recall, and adherence to the content of the materials . Employing a health app to deliver patient education, as opposed to paper-based formats (eg, leaflets and booklets), enables the use of a combination of media to engage patients in learning about their disease, which was noted as important by patients in this study with patients being particularly receptive to the dynamic educational video. A self-management app that facilitates longer-term management is important for chronic diseases. Patients expressed that the “Uric Acid Tracker” and “Gout Attacks Diary” in Healthy.me Gout were valuable tools to enable them to track their disease over time. However, enhancing the tool by incorporating features, such as automatic input of SUA values, ideally through data linkage with electronic patient records, may encourage patients to continue using the app long term. The integration of Healthy.me Gout with native features of smart devices, such as the calendar and contacts list as well as enabling in-device pop-up alerts, were seen to be important for incorporating the app into the patients’ daily lives, which could improve the longevity of app use. Indeed, the “Team” and “Schedule” features of the app were not well liked because they did not integrate with native apps of devices. Successful behavior change using self-management strategies should include not only education but also support through tools, such as alerts and personalized content and feedback [24,25]. This was reflected in our study with the ability for patients to personalize their Healthy.me Gout app viewed as being important; for example, patients wanted to create personalized lists of potential food triggers in “Diet Tips” and liked that they could collapse (if irrelevant) or expand (if relevant) information boxes in the written educational materials. In this way, patients could customize their learning journey. Similarly, patients in this study wanted the app to produce personalized summaries of their clinical gout symptoms to share with their healthcare providers during medical consultations. The findings of this study are similar to those of other mHealth app usability studies in which patients with other chronic conditions have stressed the importance of health apps being able to support patient-doctor communication during clinical encounters . Involving end users in the development of apps can improve effectiveness [3-6,26]. However, not all app developments incorporate this. By incorporating the feedback from gout patients in this study to modify the Healthy.me Gout app, it is anticipated that use of the app will be substantially improved, subsequently increasing app uptake and improving long-term gout management. Because most health app evaluations are predominantly usability studies, the ability of an improved iteration of Healthy.me Gout to support patient self-management of gout will be evaluated in a larger randomized controlled trial, wherein gout patients will use the app for a longer period and clinical outcomes will be assessed [27,28]. This is of particular importance given the movement toward the promotion of greater use of digital health interventions, particularly with healthcare providers now being encouraged to integrate patient-focused mHealth apps into their delivery of patient care [26,29]. Given that gout is a chronic condition and the studied patients presented with varying degrees of gout severity, being restricted to a 2-week period of app use meant that it was unlikely that all patients would have a gout attack or have SUA measured in this time. Thus, interactions of patients with the features of the app were highly variable. Further studies with longer monitoring of app usage are required to identify features that are utilized by gout patients in the longer term. In this study, the app was tested by only 5 gout patients who were all male, owned a smartphone, and accessed the internet frequently. Because differences among treatment regimens, treatment monitoring, and existing comorbidities are present between male and female gout patients, further app testing in female gout patients is required . Testing the app with patients with varying characteristics would enable the provision of further evidence of the feasibility of the app for a broader gout population. Additionally, the participants were a self-selecting sample. Patient responses to the recruitment strategies likely reflect higher levels of interest in learning more about their gout diagnosis or using self-management health apps and, for Study 2, required patients to have access to a smart device to participate. Experiences from this study provide important insights for the development of future self-management mHealth apps. This paper demonstrates the importance of integrating patient input into health app design and iterative development to identify and address the concerns of affected patients. Similar to many other chronic conditions, optimal management of gout requires the monitoring of a pathological value or surrogate indicator of risk, namely, SUA. SUA is influenced by medication adherence and monitoring its concentration reduces the risk of gout attacks from occurring by promoting adherence. The use of graphs to display the pathological value and risk of symptoms that occur as well as a facility to record symptoms, as in this gout app, were highly valued by patients. Future self-management apps for other chronic conditions should involve patients in their design and development and also incorporate similar features to present the relationship between a pathological value and risk of a negative clinical outcome. Additionally, once an app is deemed user friendly by end users, it is necessary to undertake clinical evaluations to determine the health benefits of introducing apps into routine healthcare. This research was funded by a National Health and Medical Research Council Program Grant #1054146 and the Lexy Davies Bequest at St Vincent’s Hospital, Sydney. The funding bodies were not involved in the review or approval of the manuscript for publication. AYSL is the only author involved in this project that could benefit from any commercialization of Healthy.me or its technologies. However, no plans have been made for this particular application. All other authors declare no conflict of interest. Interview guide to obtain feedback on developed prototypes of gout educational materials. Interview guide for post-two-week use of Healthy.me Gout. ©Amy D Nguyen, Lauren J Frensham, Michael XC Wong, Sylvain MM Meslin, Paige Martin, Annie YS Lau, Melissa T Baysari, Richard O Day. Originally published in JMIR Mhealth and Uhealth (http://mhealth.jmir.org), 15.10.2018.